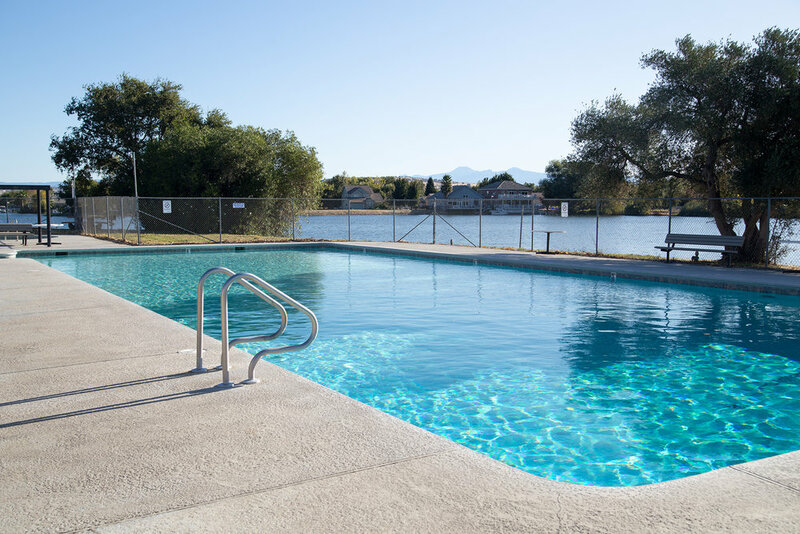 All residents and tenants have access to the pool seven days a week during the summer months. Opening date and hours will be posted. ALL residents and tenants need to have a pool pass to get in, they are $5 at the POA office. There is a pool attendant on duty from 10 am to 9 pm during summer time only. Residents and guests must comply with rules enforced by the pool attendant. There are two playgrounds currently available for the children of Lake California. One is located by Goff Hall and the other is connected to The Lake Club parking lot. Both have new equipment including slides, swings, monkey bars, and more. A committee is constantly in the process of developing new park areas for all residents to enjoy. The tennis courts, located near The Lake Club, are constantly maintained so that residents have an opportunity to participate in this ageless sport. Lights on the courts allow residents to compete into the evening. A full size basketball court is located near The Lake Club allowing residents to get together for a regulation basketball game. With fewer people, residents have access to simply shoot around or teach their children how to play. The archery range is established for use by qualified members of the Lake California Property Owners Association, Inc. (LCPOA) and their guests only. No other use is permitted. "Qualified members and guests" are those persons who have registered with the LCPOA, and having read, signed and filed the Release of Liability form and the Emergency Information and Consent form with the LCPOA office. (Members are responsible for guests, family and/or tenant actions). The Sacramento River runs along Lake California and the boat ramp is maintained so that residents have access to some of the most desirable fishing areas in the North State. Individuals travel from all over the world to experience guided or unguided fishing trips along the Sacramento River. The river access within Lake California makes this experience convenient for our residents to enjoy. Disc Golf, commonly known as frisbee golf, is easy to learn and FUN to play, and it is suitable for all ages. Played like traditional ball golf, Disc Golf involves throwing a disc from a tee off point to a target (usually a metal basket with chains). Players will keep count of throws (or strokes); the lowest number of strokes wins. So, come play a round or two behind Goff Hall on our 9 hole course with 2 levels of difficulty. Within The Lake Club, a room is designated for residents to enjoy a variety of games including shuffle board, pool, air hockey, and foosball. Food and beverages can be enjoyed in the game room so the action does not have to stop. The game room is open whenever The Lake Club is open.